Do you ride a bike? Do you see many people riding bikes where you live? Where do people ride bikes? Cities all over the world are making places for bicycling. Bicycling can be for enjoyment, recreation, and even commuting. Providing safe and proper places to bike is important to encouraging more people to bike. You can become an activist in your own community by proposing bike lanes. Bike lanes are dedicated paths on roads marked specifically for bikes. In this exercise you are to research how many people drive (or are driven) to your school and how many bike. Make a survey to collect biking and driving data over one week. You can also request distance traveled and time from home to school. After you total your surveys (be sure to report what percentage of your school population responded), chart the totals of the two modes of transportation per day. Look for peeks and valleys between driving and biking. Next measure and draft a typical parking space. Show the parking space from the top and from the side elevation with a car parked in it. Now draw a second empty parking space in plan beside the car space. Research and find out how many bikes you can park in the same space that one car takes up. 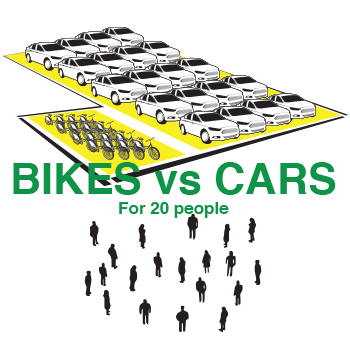 Making a poster that shows this comparison between cars and bikes sends a strong message about reducing our carbon footprint and being physically active in the way we enjoy our out doors. Now that you know how much space a car and a series of bikes take up when stopped and parked, let’s look at how much space cars for 20 people and bikes for 20 people take when in traffic. You can get your friends and friends who drive to take a picture in the high school parking lot or you can create a graphic cluster to scale of twenty cars and twenty bike riders. Looking at the comparison of these two forms of transportation makes a visual statement about which form of transportation contributes to more traffic and congestion than the other. Bike instead of Driving. Save the planet! 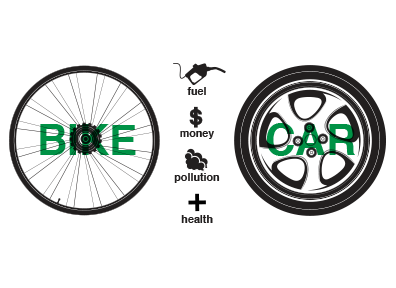 In this exercise you can research annual costs for driving a car to work vs. riding a bike. What is the energy expended per mile? On a bike it is you burning calories. In a car you are using gasoline. How about maintenance? How much does it cost to maintain a car per year or a bicycle? How about pollution? We know cars create pollution. Research how much annually. How about bike riding? You will find that in all accounts bikes are cheaper and cleaner to use for transportation than cars! Make posters comparing the two and post them in your school. Bike, instead of driving places! What constitutes a bike path? Research standard widths of bike paths that are one way and that are two-way. How wide does the space need to be? What kind of painted lines or other markers define bike paths? How are bike paths marked? 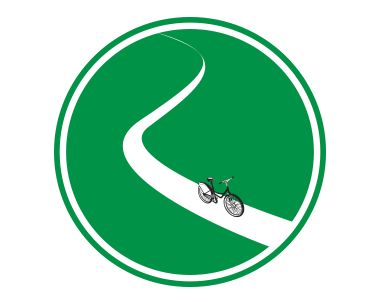 What symbols are used to distinguish a bike path from a car or bus lane? 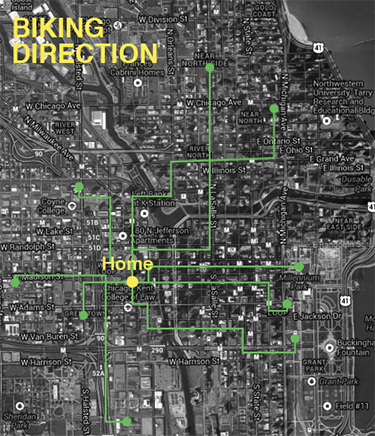 Record your findings drawing detailed and dimensioned plans of at least three different bike paths. Draw each bike path on a single sheet of paper and include photos of the bike path. Be sure to label all critical dimensions and site the source of the photo and location of the bike path. You are becoming a bike path expert! 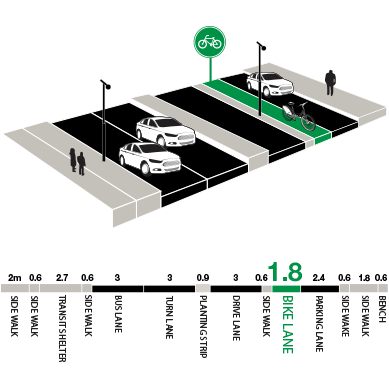 Now that you know standard widths and signage for bike lanes, take a look at your community. Do you have designated bike lanes anywhere? Contact your local Bike Federation if your community has one. See if they have bike route maps. Ask them if they think if there are enough bike lanes in your community. They will probably say that there could always be more! After talking to the Bike Federation (or someone who you know is an avid biker), take a look at your community street maps. Which way does the traffic move during rush hour (generally 7-9 in the morning and 4-6 in the evening)? You can also research street traffic and peak hours. Just as a traffic engineer would, you can access and study traffic patterns and think about places bike lanes could alleviate the traffic or provide alternate routes. Look for streets that are wide enough for a designated bike lane. Print off several street maps of an area that you wish to connect with bike lanes. Will you be proposing east west bike lanes? Will you be proposing north south bike lanes? Can the bike lanes connect through denser areas or can they take alternative routes? Make a proposal for a new series or bike lane connectors and present it to your school board. Experiment in section with Streetmix. Once you have selected a street for a bike lane, go to the street with a friend and watching for traffic, measure the width of the street from curb to curb. Sometimes a bike lane can be added in place of parallel parking spots. Sometimes the street was built overly wide for the traffic it handles. Other times, it is a more major undertaking by tearing up and using some of the median on either side of the road. Envision the road that you have chosen with a bike lane. How will you define it? Will it be a green bike lane? Will the bike lane be separated by rubber bollards? Can it be separated from car traffic with a raised planter? Will it be delineated by a white stripe and the biking symbol? You decide. You design it. Using Streetmix create your street with a bike lane or bike lanes. Screen capture the section and present it to your class. Be a bike lane engineer. How wide is a typical bike lane? Generally how many bikes can be parked in a single car parking space? What sign should be painted on a bike lane to tell car drivers and others that this area of the road is for bikers? all of these and a basket or saddle bags too!